You are here: Home » Portfolio » Who Owns My Representative? 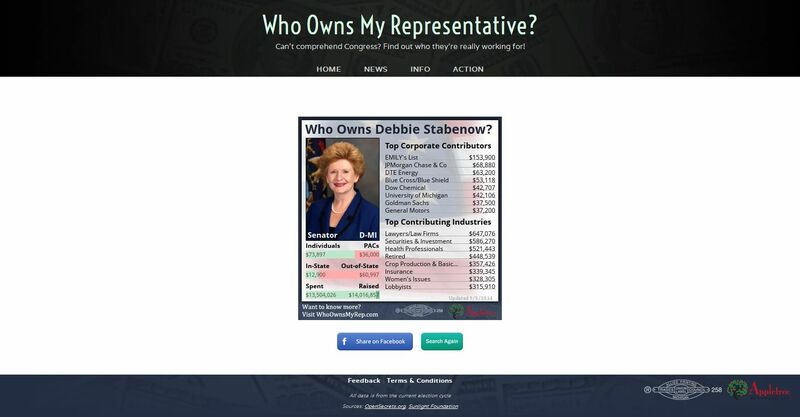 In an effort to shed light on the pervasive influence of money in politics, the team at Appletree MediaWorks created this online tool using API integration to empower Americans with an easy way to find out which moneyed interests might be affecting their Congressional representatives’ decision making. The project was developed to be self-sustaining by pulling in data from various political APIs (such as OpenSecrets and the Sunlight Foundation) and merging the information into pages and images in real time. Our programmers incorporated dynamic image generation technology to create summary graphs from the data which could then be easily shared to Facebook. When people saw these images being shared, many were curious and clicked to look up their own representatives, ultimately drawing fresh traffic back to the site.